Henrique is an amazing young man! While attending college, he finds a way to make it to the Box every morning at 6am. The progress he has made has been incredible. From never loading more than 10 lb plates on the bar to now cleaning 225 lbs! 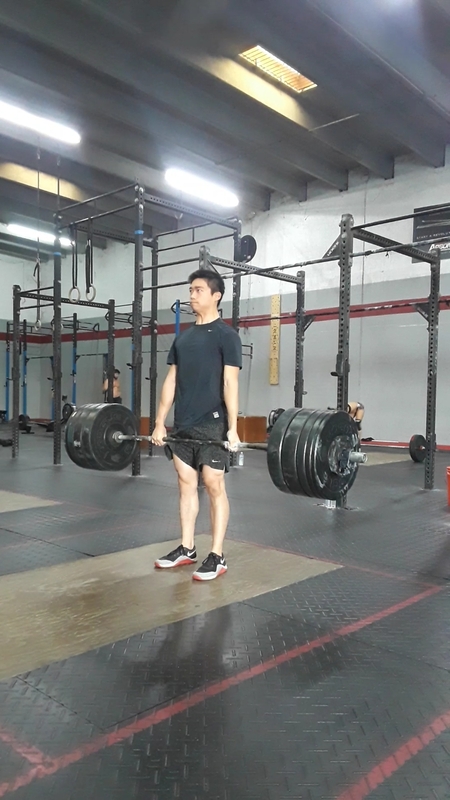 Henrique has developed a love for weightlifting and attends barbell class every Friday. Even when he suffered a wrist injury, he still came every week and did modified workouts. He doesn’t let setbacks deter him and is one of the most consistent members in the gym. When he wants to learn something new, he sets the goal, does the progressions and accessory work, and accomplishes it. Wanting to learn how to do a ring muscle up, Henrique took the time to build the strength, followed the step by step progressions Coach Lee gave him and in a few weeks did his first muscle up! It is very exciting to see Henrique’s progress and we can’t wait to see what he achieves next! Tell us about yourself? I am 19 years old and I am originally from Brazil. I moved to Florida in August 2017 and not long after I started doing Crossfit with my sister. Currently I am a sophomore pursuing a degree in business administration. What made you start Crossfit? I started doing Crossfit because of my sisters, Valeska and Eliza. They started doing it in Brazil back in 2014 and one day they decided to take me for a trial class. After the class, I felt broken; I felt sore all over my body and decided that Crossfit was not for me. But after some bad experiences regarding my fitness level (having once throw up while playing soccer) I figured that I needed to exercise more. So, when I moved to Florida and my sister joined the box, I decided to give Crossfit a second try, and I’ve been doing it ever since. What have you learned since joining Freakin CrossFit? Since joining, I’ve learned to be more resilient, always trying to push myself a little harder, either for one more rep or to be a few seconds faster. I also learned I can do much more than I think I can do, and sometimes you just have to go for it without thinking too much about it. What is your proudest CrossFit moment? I think my proudest moment was when I got my first ring muscle-up because of how unexpected it was. What’s your favorite exercise movement? Right now, my favorite exercises are Cleans and Bar muscle-ups. What are your CrossFit goals? Currently my main goal is to become proficient in every Crossfit movements and hopefully compete one day. What does your nutrition look like? Has it changed since starting CrossFit? I don’t really follow any diet or specific nutrition plan. Usually, I just eat what I want to, without any restrictions, however, I try not to eat too much junk food and always try to eat vegetables. What is one tip you would give someone who is thinking about starting CrossFit or just started? One tip would be to focus on technique first and then on the weight that is on the bar. When you’re not CrossFitting, what is your favorite thing to do? Usually I love to do outdoor activities when I am not doing Crossfit. I am specially fond of tennis, a sport my entire family plays.